where I think I see becomes I see. As the story goes, President Lincoln during a cabinet meeting voted "aye" on some matter before the group while six cabinet members voted "nay.” The President then announced the result: "Nays, six. Ayes, one. The ayes have it." So you want to argue with or agree with Max about coin images over the eyes. Here are seven past postings in this blog (one aye and six nays, as it turns out) that may offer some help. BEGIN with Coins on Eyes Issue Again which includes a six page illustrated extract from Max’s 2011 Totun research paper. 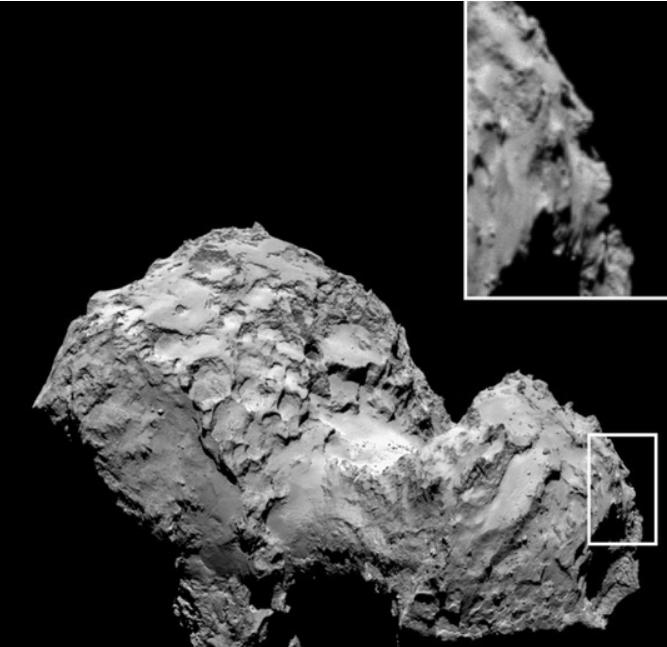 Though the face on the comet, with its shadowy profile, looks almost sinister, it is far from unique: Humans are wired to see faces everywhere. In fact, the phenomenon is so common that it even has a name: Pareidolia, which in Greek means, in essence, "faulty image." "Your brain is constantly trying to make the most out of just the tiniest thing," said David Huber, a psychologist at the University of Massachusetts Amherst, who has studied the phenomenon. "You’re sort of in overdrive on imagining from limited information that there is a face." From the Shroud of Turin, thought to carry the imprint of the crucified Jesus’ face and body, to faces in the clouds and the Virgin Mary on a grilled cheese sandwich, people have always seen faces in everyday objects. Even the faintest hint of eyes, nose and a mouth in roughly the right places will often trigger the brain’s facial recognition system, Huber said. When people see faces in images, a brain area called the fusiform face region lights up in brain scans, said Kang Lee, a developmental neuroscientist at the University of Toronto, in Canada, who has worked with Huber on several studies of how people process faces. This brain region is likely a key junction point where low-level visual information is processed to say "Aha! It’s a face," Huber said. The distance between facial features seems to play a key role in the brain’s ability to spot and uniquely identify different faces. A prime example of pareidolia and its connection to religious images is the Shroud of Turin, a cloth bearing the image of a man — which some believe to be Jesus — who appears to have suffered trauma consistent with crucifixion. The negative image was first observed in 1898, on the reverse photographic plate of amateur photographer Secondo Pia, who was allowed to photograph it while it was being exhibited in the Turin Cathedral. The psychological phenomenon that causes some people to see or hear a vague or random image or sound as something significant is known as pareidolia (par-i-DOH-lee-a). The word is derived from the Greek words para, meaning something faulty, wrong, instead of, and the noun eidōlon, meaning image, form or shape. Pareidolia is a type of apophenia, which is a more generalized term for seeing patterns in random data. Some common examples are seeing a likeness of Jesus in the clouds or an image of a man on the surface of the moon. 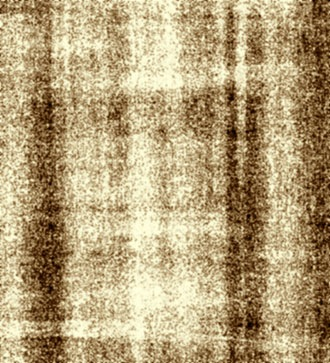 The picture of a man on the Shroud of Turin is not at all mere random data. It is unmistakably a picture of a man. It might be a yet unexplained work of art. It might even be a photograph by Leonardo da Vinci. (Humor me, I’m just trying to make a point). It might be the product of some natural phenomenon. Or it might be a miraculous acheiropoieton, an image not created by human hands. But it is not a pattern of random data that just so happens to look like a man. That would be so extraordinary and so statistically implausible as to be truly miraculous. It is not a pareidolia. Whatever anyone may think about the shroud’s authenticity, there is one thing everyone should agree about: the image of a man with a well-featured face on the shroud is not a pareidolia. Here is a handy search of this blog on the subject. There’s a big flap over a flapjack in the news and the Christian blogosphere this week. The whole thing began on Good Friday when a cook in the Cowgirl Café of Norco, CA was trying to make a Mickey Mouse pancake but ended up with something wholly (holy?) 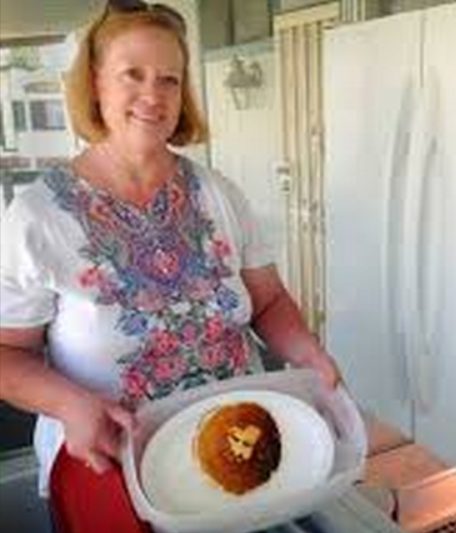 unexpected instead: a johnnycake with the face of Jesus on it. . . .
And now, Glenn Beck is adding his two cents worth. On his radio program yesterday, Beck defended the possibility that the Jesus pancake was indeed a divinely-inspired message from God. His co-hosts however, were unimpressed. Wait a minute, Beck was showing the pictures on a radio show? A radio show? 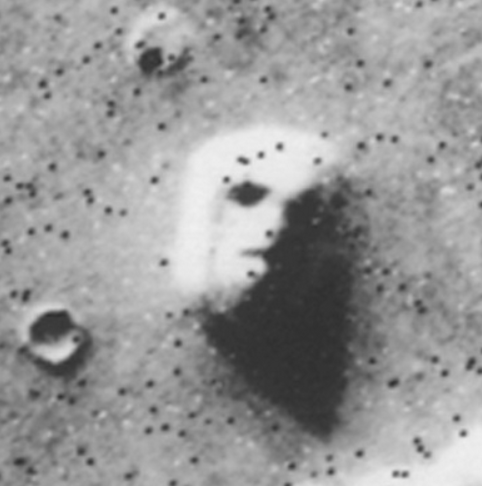 ”Pareidolia” is the psychological phenomenon whereby a vague or random stimulus (often an image or sound) is perceived as significant or having recognizable form – classical examples being seeing the “man” in the moon (or the “rabbit pounding rice” if you are Japanese), the Shroud of Turin, and the “face” in the Cydonia region of Mars. Is the pareidolia on the shroud? I certainly think so. It includes, in my opinion, the images of coins, lettering, flowers and plants, and the appearance of teeth. 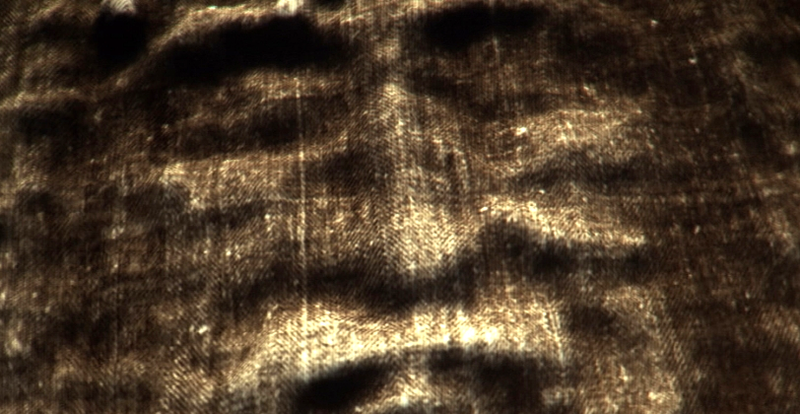 But the image[s] of the man on the shroud are not and certainly cannot be pareidolia. 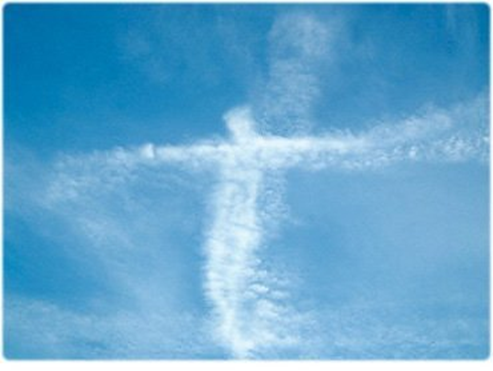 Joe Marino passes along some more Jesus pareidolia from a WND article, Google photo: Jesus just spotted in sky? As Joe points out the Kit Kat photo, mentioned in the article is old stuff; see, Jesus in Toledo by way of a piece of candy in January, 2011. Dr. Paul Lakeland, director of the Center for Catholic Studies at Fairfield University, says visualizing the Creator of all things in everyday objects has become a way for people to bring their beliefs to reality, as they desperately want to see signs and wonders. He indicated the Catholic Church often downplays any credence to similar sightings. Pareidolia is a big deal when it comes to things some claim to see on the shroud like coins, flowers and inscriptions. 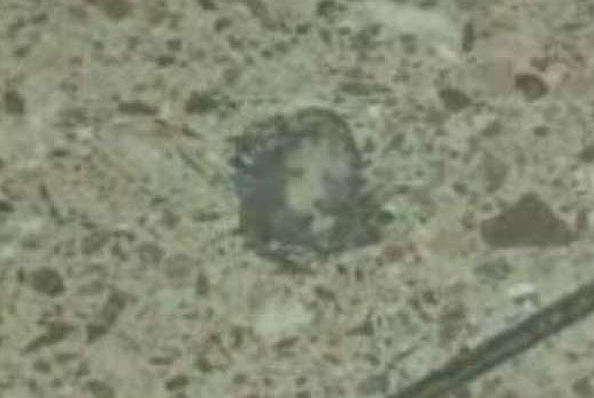 A FLOOR tile said to feature an image of Jesus Christ on its surface has seen visitors flock to an American airport. The apparition in Terminal 3 of the busy transport hub in Phoenix, Arizona, has disciples returning regularly to marvel at its resemblance to the son of God. Unemployed dental hygienist Becky Martin — who has been to visit the site every day for the last TWO WEEKS — told Phoenix New Times: “It’s definitely Our Lord Jesus Christ. And when Becky was asked whether it might be easier for Him to just send a telegram, she replied: “No, if He did everyone would just think it was a fake. 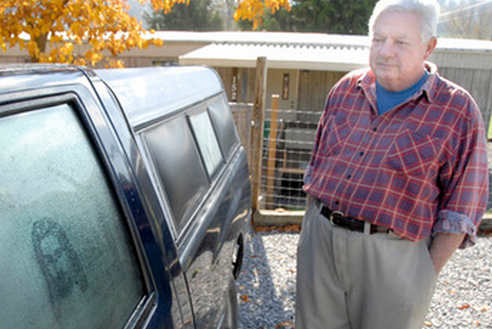 Catholic priest Father John Shelter warned believers against getting too carried away. He said: “The Church doesn’t automatically put its seal of approval on every apparition. “They typically wait a few years before weighing in on its significance. The most famous apparition of Jesus is thought to be the Shroud of Turin – a piece of fourteenth century linen said to bear the image of Christ which is housed in northern Italy. It is still the subject of intense debate and speculation to this day. Keep it simple; just call it a piece of 14th century linen. "… But this is so only if you believe that the images of coins are there. I’ve spent years considering this question; I don’t believe they’re there. What people see, I think, is pure pareidolia. "…a psychological phenomenon involving a vague and random stimulus (often an image or sound) being perceived as significant … Common examples include seeing images of animals or faces in clouds …"
"… the imagined perception of a pattern or meaning where it does not actually exist, as in considering the moon to have human features". Stephen, if you don’t like the term pareidolia – and I still do – then how about visual noise? However, in this Porter is simply ignoring the evidence above, for example, that Jackson, et al. 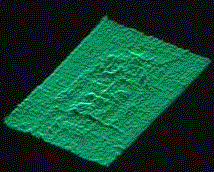 found on their VP-8 Image Analyzer three-dimensional `relief map’ of the Shroud, images of two, round, flat objects over the eyes, which were the same size and shape of Pontius Pilate leptons. I do not argue that there appears to be something on the eyes of the man of the Shroud, and it may well be coins or potshards . . . But, I’m not even sure of that. 2) In the photo Stephen, you provide, seemingly (I agree with you on this) sourced from Giovanni Tamburelli of the Centro Studie Laboratori Telecomunicazioni S.p.A., Turin, Italy, we see, as you put it, “small, round, raised, object over each eye.” These certainly don’t appear like, “two, round, flat objects.” These could very well simply be eyelids. They did not "imagine" them-the images really are there. And this was confirmed by others using different three-dimensional computer processing. Even if the details on the face of those two objects could not be seen, it would still be a reasonable conclusion that they are Pontius Pilate leptons. Look! How can this possibly be a reasonable conclusion? Potshards? Um, maybe. Nothing but the normal curvature of eyes, perhaps swollen eyes? It seems so. 3) The History Channel provides an image prepared by Ray Downing during the making of the Real Face of Jesus. I think this provides good confirmation that “two, round, flat objects” ARE NOT clearly (conclusively) there. If anything, the 3D images, and there are others as well, argue against the presence of coins over the eyes. And Porter is simply ignoring the improbability that a lituus shape and even one letter, in the correct order and angle of rotation around the lituus (both of which can be clearly seen on the Shroud – see above) `just happen’ to be chance patterns in the Shroud weave, which `just happen’ to be over the eye of the man on the Shroud, is of the order of 1 in 1.1216 x 1015. Not to mention that the `chance patterns’ are three-dimensional, round and flat! If I thought that what constituted particular shapes and letters was completely or mostly the same chemical product that constitutes the image of the man on the shroud, I might think the statistical argument has merit. But I don’t think so. The statistic that you refer to were based on observations made on the 1931 Giuseppe Enrie photographs, beautiful and detailed, technically wonderful and absolutely wrong for this kind of analysis of small details. Why? Because the film was high resolution orthochromatic film. The problem was compounded when Enrie coupled this film choice with near-raking light thus creating countless miniscule patterns and shapes from the shadows between threads of the weave. 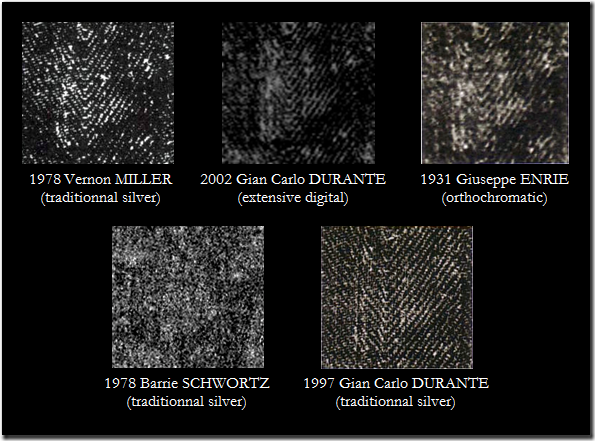 Since orthochromatic film basically only records black or white, any mid-tone grays that existed on the cloth as image, background banding patterns in the ancient the linen, and accumulations of centuries’ worth of dirt particles caused more miniscule imaging. The picture on the right is an approximation of banding found in the face area. The dark horizontal band about a quarter of the way down goes right through the eyes. Vertical banding lines also go through both eyes. Before you can do any statistics you must adjust for the banding noise, shadow noise and visible contamination noise.
. . . the high resolution orthochromatic film used by Enrie, coupled with the extreme raking light he used when making the photographs, created an infinite number of patterns and shapes everywhere on the Shroud. Since orthochromatic film basically only records black or white, any mid-tone grays of the Shroud image were inherently altered or changed to only black or only white, in essence discarding much data and CHANGING the rest. And now Stephen, you suggest something that just isn’t true. From other things Porter has written, for example, his preferring a naturalistic explanation of the Shroud’s image, I assume that he does not want there to be images of coins over the Shroud man’s eyes because that would be more problems for a naturalistic explanation of the Shroud’s image, and further evidence for a supernaturalistic explanation of it. I consider any image caused by radiation, of any kind, naturalistic. The only question is where the very natural radiation came from. I remain totally unconvinced from any evidence or by any argument so far presented that miracles produce energetic byproducts. Let me repeat what I said: None! Actually, I have a gut feeling that the image is miraculous in ways none of us have yet imagined (supernatural if you prefer that term). How is not something I am ready or able to articulate. I doubt the image was caused by the resurrection or by any energetic byproduct of the resurrection just as much as I doubt it is the accidental product of a pre/non-resurrection chemical reaction. Therefore Porter blithely dismisses all the evidence above that there are Pontius Pilate coins over the eyes of the man on the Shroud with the `magic’ word "pareidolia"! But in so doing he goes far beyond what the word "pareidolia" means. However, Porter is welcome to his beliefs and I don’t see my role as convincing him, or anyone, but just presenting the evidence and letting my readers make up their own minds. Blithely? You mean, lacking due thought or consideration? Talk about going beyond the meaning of a word. I know there are still a few people who think there are images of coins over the eyes. That’s unfortunate.